Sakai Guides and DocumentationSakai Complete User Guide Tests and QuizzesHow do I adjust the layout and appearance of an assessment? 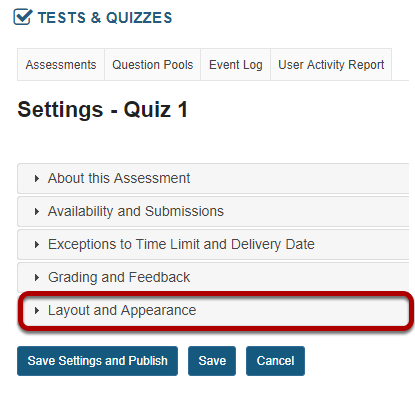 Layout and Appearance options control the overall look and feel of the test for students, such as how they navigate from one question to another, and how the assessment questions are numbered if the assessment has multiple parts. For more information on additional assessment settings, see How do I inspect and adjust the settings of an assessment? In the assessment Settings page, click Layout and Appearance. You can control the presentation of the questions according to the options shown. 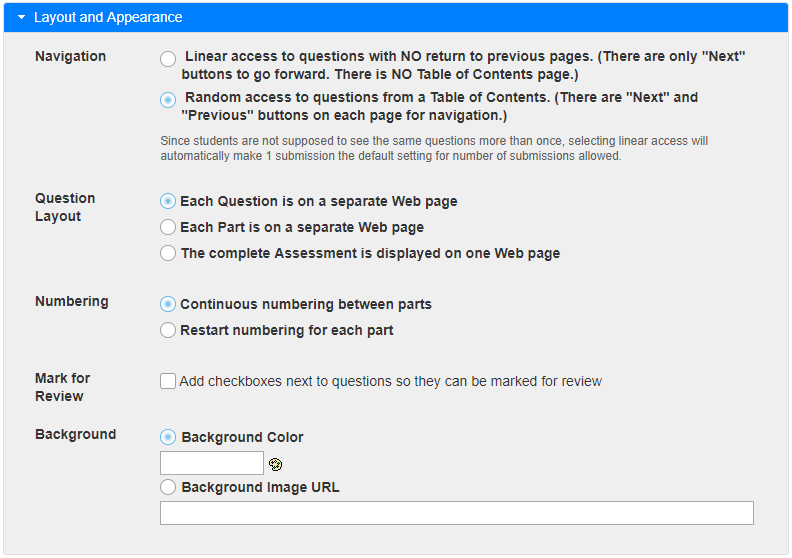 The default option is to display Each question on a separate Web page. This is the recommended setting, as students' answers will be saved as they navigate through the test using the Next, Previous, and Table of Contents buttons. If you have separated your assessment into parts, you can use the second option to display Each Part on a separate Web page. To display The complete Assessment on a single Web page, allowing students to scroll through it, click the third choice. WARNING: If you choose The complete Assessment is displayed on one Web page, students MUST click Save to ensure that their answers are saved. Displaying the complete assessment on a single Web page greatly increases the risk that students will lose their work. If your assessment has multiple parts, choose the numbering pattern here. Continuous numbering between parts presents the questions in continuous, sequential order. If you choose to Restart numbering for each part, questions are numbered with the part number, then the question number. If your assessment navigation allows Random access to questions from a Table of Contents, you can check a box to Add checkboxes next to questions so they can be marked for review. Student view of mark for review. When students are taking the test, this option will allow them to check a box, Mark for Review, under each question. When they view the Table of Contents, questions Marked for Review will display a question mark icon (?) so they can easily identify and revisit marked questions. You can choose a color or image for the background here. To select a Background Color, click the palette icon. To add a Background Image, enter the URL of the image's location. An image smaller than the screen will be tiled to cover the entire screen area. Prev: What are the Grading and Feedback options for an assessment?